For some good new people to follow, try Ann Pettifor from UK and the Renegade Economist. Last Saturday Radio NZ interviewed an English guy called Ross Ashcroft, who calls himself the Renegade Economist. Like all good campaigners he interviews people and puts the interview up on vimeo.com. Kim Hill's interview with him is at http://www.radionz.co.nz/national/programmes/saturday/audio/2517815/ross-ashcroft-renegade-economics. Ross has produced a film called The Four Horsemen, which is part of The Documentary Edge Festival. Welington shows are at the Reading as follows: Monday 21 May 8.45pm, Sunday 27 May 4.45pm and Thursday 312 May at 8.45pm. I gather it is also on in Auckland. Tonight I have just watched Ross Ashcroft interview Ann Pettifor, whose name had been cropping up recently in various tweets. 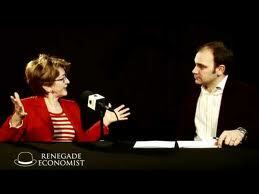 Half an hour interview with this bright woman economist, who has been a Fellow of the New Economics Foundation of UK for three years. She led a huge campaign, successfully winning the relief of $$350 billion worth of debt for Third World Countries in Jubilee 2000. There were 60 countries involved. Back in UK she noticed her friends getting huge mortgages when they were not exactly in secure jobs and she wrote a book called The Coming First World Debt Crisis in 2003. She said people thought she was a loony and she sold only a few copies. The growing debt really began to blow out in 1971 after Nixon delinked from the gold standard and the UK deregulated credit. She talks of an article she is reading by Ben Broadbent, who is on the Board of the Bank of England but came out of Goldmann Sachs. She said the paper is deceptive yet packed with data. But she was convinced it was written in Goldmann Sachs office because it argues the Global financial crisis was due to low interest rates. Broadbent is defending the right of banks to be deregulated. He has huge political and economic power. Why should banks get a return on an effortless activity, by entering numbers into ledgers or by engaging in speculative activities? Ann Pettifor has just returned from an INET conference in Berlin financed by George Soros, where Steve Keen and Michael Hudson participated. (Initiative for New Economic Thinking). She concludes by saying she thinks people should be politically involved. Roosevelt stood up to the banks in the 1930s and it takes leadership to do it. We need the leaders. We need capital controls to control borrowing across borders. Banks go looking to find they can borrow at 3% from China but 4% at home. 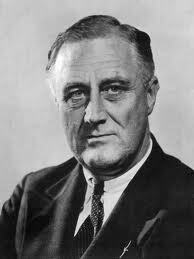 Roosevelt brought in capital controls. Secondly we need to stop banks lending for speculation. She says politicians have been taken in by bribes from banks. We must hold our politicians to account. Once the public understands, there is no stopping them. If people understand that banks create money out of thin air and charge exorbitant rent on it, then it snowballs. One in five voted for Fascist party in the French elections, very worrying, similar to Germany in the1930s. People are desperate and can't articulate it.